XFP modules are hot-swappable and protocol-independent. They typically operate at near-infrared wavelengths (colors) of 850 nm, 1310 nm or 1550 nm. Principal applications include 10 Gigabit Ethernet, 10 Gbit/s Fibre Channel, synchronous optical networking (SONET) at OC-192 rates, synchronous optical networking STM-64, 10 Gbit/s Optical Transport Network (OTN) OTU-2, and parallel optics links. They can operate over a single wavelength or use dense wavelength-division multiplexing techniques. They include digital diagnostics that provide management that were added to the SFF-8472 standard. XFP modules use an LC fiber connector type to achieve high density. The AscentOptics 10G XFP Module offers customers a variety of 10 Gigabit Ethernet and Packet-over-SONET/SDH (POS) connectivity options for data center, enterprise wiring closet, and service provider transport applications. 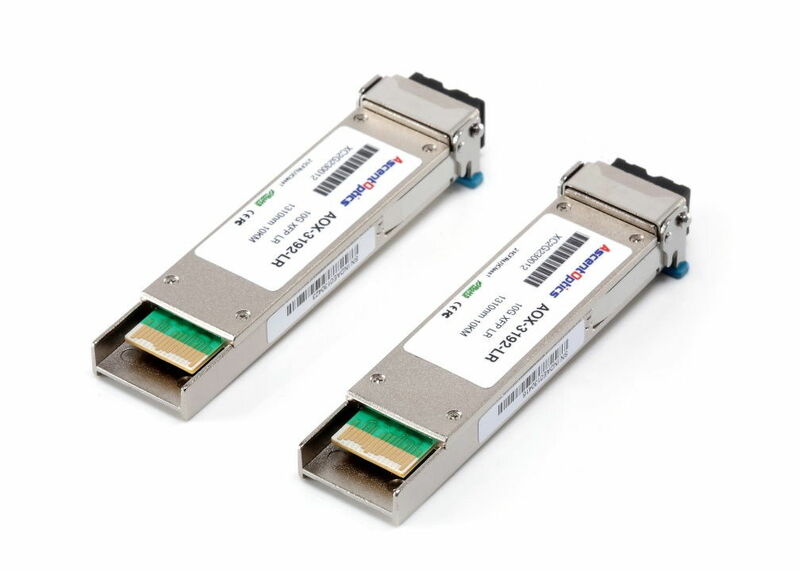 China Good Quality SFP Optical Transceiver Supplier. Copyright © 2013 - 2019 sfpopticaltransceiver.com. All Rights Reserved.